Most architecture follows the styles of its time. Then there are the truly odd structures. For example, the Tower of Pisa is famous for its lean. Surprisingly, it is not the only leaning tower around. It just happens to be the most popular. Some leaning towers are even more tilted and have more impressive histories and backstories than the Tower of Pisa. Built in 1194, the 65-meter-high (213 ft) Minaret of Jam has a slant of about 3.47 degrees, which is less than the Leaning Tower of Pisa. However, the minaret is 9 meters (30 ft) taller than the Tower of Pisa, which was built over a century later. 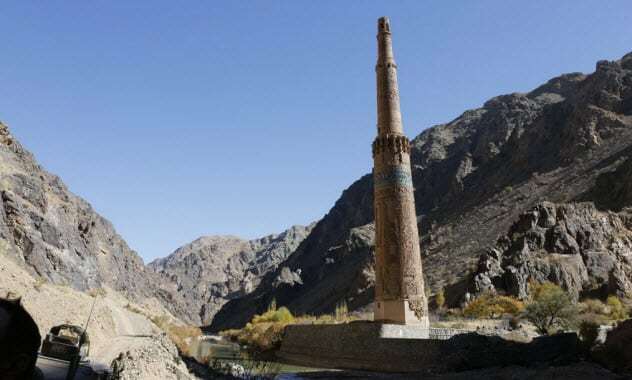 The minaret was built by the Ghurids, a tribe that ruled an ancient empire that spanned from Iran to Bengal. The capital of the empire was called Firozkoh (“Turquoise Mountain”). Its location has been lost to history but is believed to have been somewhere around the minaret. The structure leans because the ground below it is waterlogged and not strong enough. Two mountain gorges and rivers meet at the area where it is located. The land on which the minaret was built is only slightly flat. The minaret is not popular because of its remote location. Anyone who wants to see it will have to endure a 12-hour journey over rocky roads. In the past, the road was filled with bandits who robbed travelers. These days, it is controlled by the Taliban. The river is also usually flooded during the spring and summer. The Great Mosque of al-Nuri was built in 1172 on the orders of Nur al-Din Mahmoud Zangi, for whom the structure is named. He ruled over the area now known as Mosul and Aleppo. Nur al-Din Mahmoud Zangi was famous for leading a jihad against the Christian Crusaders, which resulted in the capture of Damascus (then under the control of the Crusaders). Nur al-Din, a Sunni, was known for his attempts to have the Sunnis rule over the Shiites. Little wonder that Abu Bakr al-Baghdadi, the self-styled leader of the Islamic State, decided to announce the establishment of a “caliphate” in July 2014 right inside the mosque after his terrorists captured Mosul from Iraqi forces. The original mosque built by Nur al-Din collapsed long ago and has been replaced. But the original 45-meter-high (150 ft) minaret, which is called al-Hadba (“the humpback”), remained standing. No one knows why or when the humpback started to lean, but the tilt has been observed since the 14th century. According to folklore, the humpback tilted when Muhammad flew overhead on his way to heaven. This tale is definitely untrue because Muhammad died long before the minaret was built. The slant is believed to be caused by heavy winds, the weak plaster used to hold the bricks, or the sunlight hitting one side of the bricks. During the Iran-Iraq War, certain bombs targeted at Mosul damaged some underground pipes. This caused sewage to seep into the ground and harm the foundation of the building, worsening the tilt. In 2012, UNESCO revealed that the humpback was in danger of collapse. 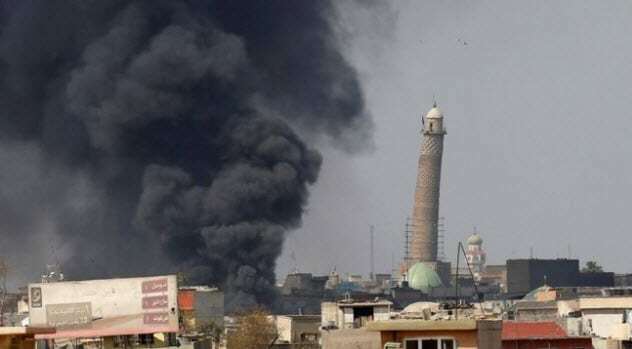 However, they will not need to bother anymore because the Islamic State blew it up in 2017 in an attempt to stop the advancing Iraqi army from capturing it. The leaning tower of Suurhusen holds the Guinness world record for the most unintentionally leaning building in the world. It tilts by 5.19 degrees. For comparison, the Leaning Tower of Pisa slants by 3.99 degrees. 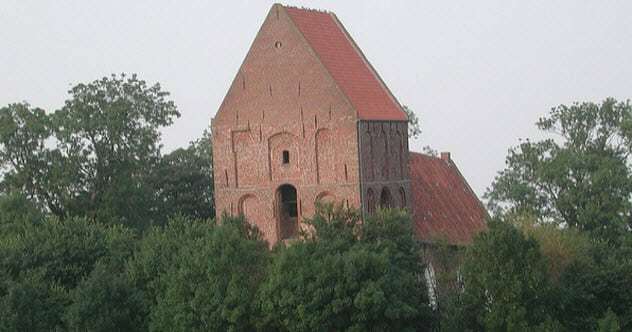 The leaning tower of Suurhusen forms part of a church, which is attached to it. It was built in the Middle Ages in a swampy environment. This caused the builders to bury oak trees in the ground before laying the structure’s foundation. The building was stable and didn’t lean for centuries. When the surrounding land was drained sometime in the 18th century, the oaks dried out and caused the tower to tilt. By the 1970s, the structure was so compromised that some feared it would collapse. The government tried to demolish it, but the locals stopped it. The locals have been maintaining the tower ever since. The church and tower are no longer used for worship and are only maintained as a tourist attraction. Visitors are not allowed to enter the church or tower. They cannot wander too close, either. A safety zone has been enforced around the tower to ensure that it does not hit anyone if it ever falls. The 80-meter-high (262 ft) Leaning Tower of Zaragoza tilted to one side immediately after it was built in 1504. It is suspected that the construction was rushed and the quality of the tower was compromised, causing the slant. Nevertheless, the Leaning Tower of Zaragoza rivaled the Tower of Pisa in popularity. The tilt worsened over the years. At one time, it was feared that the tower would crash to the ground. 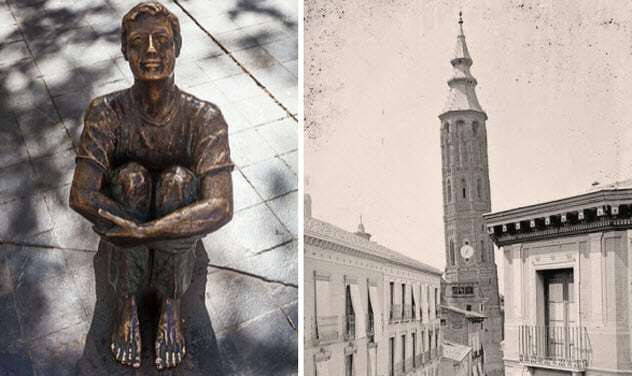 In 1878, the Zaragoza city council hoped to reduce the slant by removing the tower’s spire. It had no effect, and the tower continued to lean. The city council demolished the tower in 1892, much to the dismay of the populace. The leaning tower of Bad Frankenhausen is a 56-meter-high (183 ft) church steeple. It was on the verge of collapse, and maintenance attempts had not been impressive. The steeple leans at 4.8 degrees, which is more than the Tower of Pisa. The church steeple’s tilt has been recorded since at least 1640. The slant was caused by the underground geography of Bad Frankenhausen. Approximately 250 million years ago, Bad Frankenhausen was part of the ocean. The water later dried, leaving salt deposits that were covered by earth over millions of years. About 95 million years ago, the Kyffhauser hills rose from the ground. Bad Frankenhausen is situated at the southern slope of the range. The land where the hills rose began to crack, allowing water to enter the ground. The water washed the buried salt away, weakening the land above and forming large, gaping holes underground. 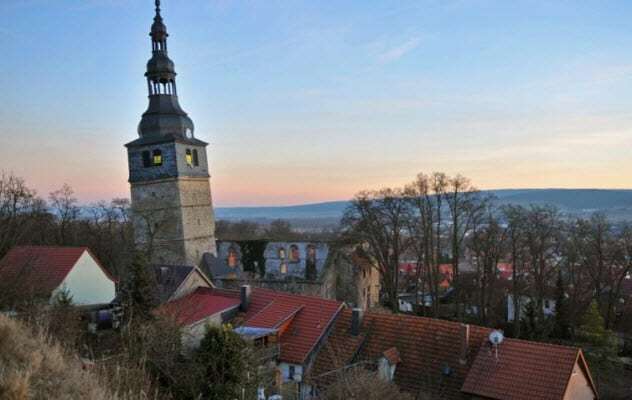 Amid fears that the leaning tower and its attached church could collapse at any time, the city council of Bad Frankenhausen acquired the structure. A federal program will provide funding to stabilize the tower. The Leaning Tower of Teluk Intan was built in 1885. 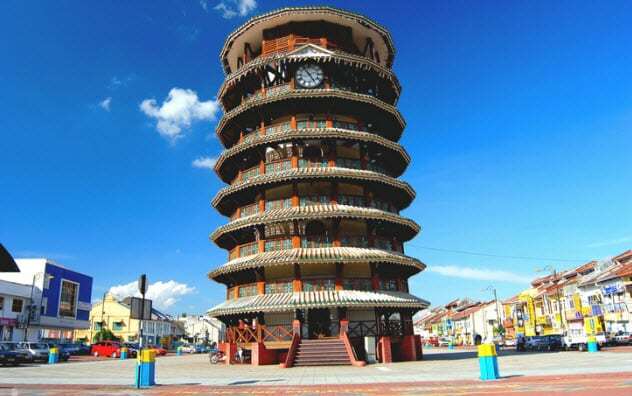 While originally intended as a tank to store drinking water for the residents of Teluk Intan, the structure doubled as a clock tower when a huge clock, which was used by the town’s timekeeper, was attached after construction. The tower was funded by the residents of Teluk Intan. The architectural style was constructed with a distinct Chinese feel because the building’s engineer and the majority of the town’s residents at that time were Chinese. The tower was built with wood and brick, which was not strong enough to maintain the weight of the water tank. The soil was also exceptionally soft for such a heavy structure. Both factors caused a leftward slant to the tower. 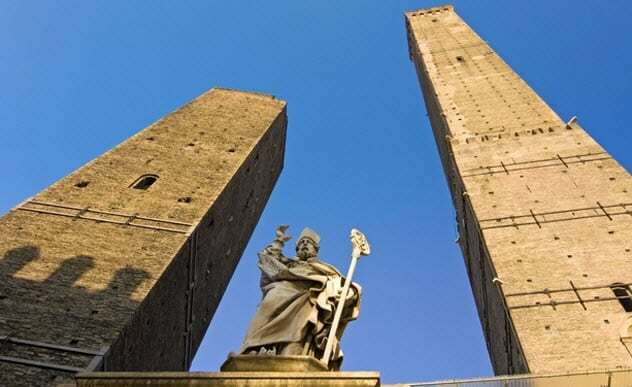 Due Torri (“Two Towers”) refers to two leaning towers, Asinelli and Garisenda. Both have greater slant angles than the Tower of Pisa. Garisenda Tower even holds the record for the most tilted tower in Italy. The two towers were built in the 12th century and are named after the families that ordered and funded their construction. While the structures were primarily built for assault and defensive purposes, the families also used them to show off their wealth. At the time, the political landscape in Bologna was tense. The city split among two rival groups: the Guelphs and the Ghibellines. The Guelphs supported the Pope, while the Ghibellines supported the Holy Roman Emperor. This made many rival families build towers to fortify their areas of control. Hundreds of such towers were constructed, but only Asinelli and Garisenda ended up with slants. In 1079, the Huzhu Pagoda was built by General Zhou Wenda to store five Buddha statues he had received from Emperor Song Gaozong. It started to lean soon after construction. The slant worsened in 1788 when the structure was damaged by a fire caused by some firecrackers set off during a fair. The tilt worsened in the 19th century when some villagers dug a hole at the foot of the tower over rumors that gold was buried there. This left the side opposite the lean with a gaping hole as if someone had bitten a chunk out of the structure. 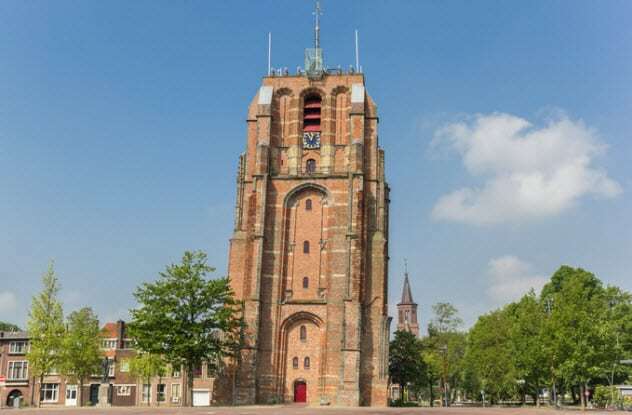 Today, the tower tilts at an amazing 7.1 degrees, almost twice the slant of the Tower of Pisa and more than the leaning tower of Suurhusen (which holds the record for the most unintentionally leaning building in the world). 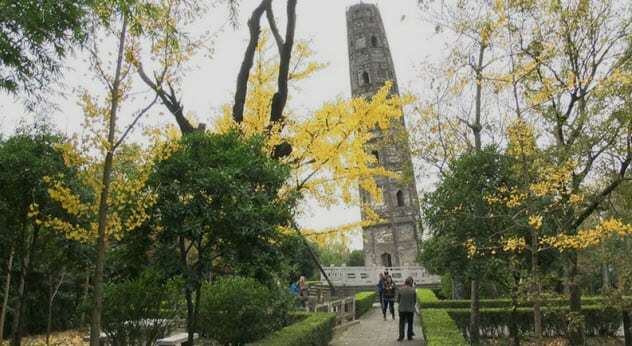 Despite having a steep slant and suffering extensive damage, Huzhu Pagoda is well maintained and not in danger of collapse. It is called the “Won’t Topple in a 1,000 Years Ancient Tower” for this reason. The tilt is said to result from two different kinds of soil under the tower’s foundation. The Oldehove is an incomplete and curved leaning tower. Construction began in 1529, but it was abandoned in 1533 after the structure started to tilt. The builder, Jacob van Aken, initially attempted to counteract the slant by curving some parts of the tower. It didn’t work. Oldehove was designed to be 120 meters (400 ft) high, but construction stopped at just 48 meters (157 ft). Although a church was supposed to be attached to the tower, it was never added. Even so, the tower has been used as a store, timepiece, and observation post. Today, it is maintained as a tourist attraction. The Leaning Tower of Torun was built as part of the city walls around the turn of the 14th century. The tower had three walls. One side was left without a wall to allow ammunition to be lifted to the upper floor. The structure started to tilt sometime in the Middle Ages. The tower leans because it was built on sandy soil. However, this has not stopped people from attributing the slant to superstitions and folklore. Some say that God made the building lean after Copernicus, a Polish mathematician and astronomer, made a discovery that countered the existence of God. According to folklore, the structure was built by a knight who had fallen in love with a woman. This was against the rules of knighthood, making the monarchy order him to build a leaning tower as punishment for his dishonesty. Supposedly, honest tourists will be able to remain upright if they have their backs and legs touching the tower while dishonest tourists will be unable to remain upright. 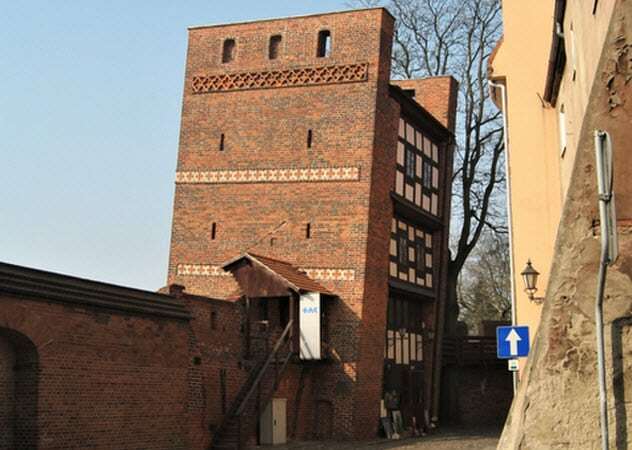 The Leaning Tower of Torun was decommissioned as a city wall in the 18th century. A fourth wall was added, and the building was turned into a women’s prison. It was later converted into a gunsmith workshop and then living quarters. Today, it contains a pub and an office run by the Municipal Institution of Culture. Read about more crazy construction projects on Top 10 Abandoned Skyscrapers From Around The World and 10 Of The Craziest Construction Projects Ever Proposed.